When ordering through Internet, the order is confirmed when SWEDX AB has sent a confirmation e-mail to the customer. The confirmation sends normally within 24 hours. Valid Order The customer accepts SWEDX Sales Conditions and the order is cogent unless SWEDX AB confirms any order cancellation. Delivery of products available in our warehouse is processed same day or latest the day after the payment is confirmed. In case the product is not available in our warehouse, the delivery time might be longer. In the order confirmation sent to the customer, it is stated if any delays might come up. SWEDX chooses delivery way. If any special delivery conditions are required by the customer, it requires SWEDX confirmation. Eventual extra charges should be paid by the customer.The freight charges are presented in the "Checkout" before you confirm your order. Please provide your order number as payment reference. The order number is given in the order confirmation which you receive in your e-mail because after you confirm your order. Returns (valid only for orders delivered in SWEDEN for private persons) SWEDX follows in Sweden the rules given in "Konsumentköplagen/Distansavtalslagen" regarding order canceling. You have as a customer the right to return your order within 14 days after you received it. The products shall be returned complete and in original package in the same condition as delivered. The freight charge for returns shall be paid by the customer. 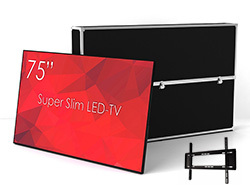 SWEDX sells all products with 1 year warranty.The warranty for LCD/LED-TV is 3 months when it is used commercially. Observe that if the customer asks for product service by warranty and it shows that the product, after testing, is not defected, the customer shall pay 350:- SKR (VAT included) as checking fee. SWEDX warrants that every delivered order is checked before delivery. If the product/porducts is/are not functioning, SWEDX will repair/replace the product/products free of charge. The customer should inform SWEDX about such matters as soon as possible, but latest within 5 days after receiving the delivery.Damage due to transportation must be reported within 7 days of receipt to the shipping company and SWEDX, email: support@swedx.com. You should not under any circumstances accept a package that looks damaged, even if you think that the content is intact, but you refuse to accept the package and complain about the damage to the shipping company! If you discover damage after you opened the package notify the immediately the shipping company and SWEDX and you should be able to prov that the damage is due to transportation, although there were no indications of external injuries on the packet.To send a complaint to SWEDX customer service please follow the link. SWEDX offers support through e-mail support@swedx.com. SWEDX applies 3 pixel policies for LCD/LED. The pixel policy is found under the pixel policy tab for each product in its information page. Below are links to SWEDX pixel policies.